Halloween may not be on your radar just yet, but if working as a zombie is on your bucket list, you’ll want to pay attention. Theme parks across the country are currently hiring seasonal workers to be a part of their Halloween-themed festivities. Think of it as extended trick-or-treating, except instead of candy you’ll get a paycheck and free park admission. These gigs are temporary — but fun — and you’re sure to walk away with a fun story to tell. Happy haunting! Busch Gardens Tampa Bay is looking for seasonal entertainers to scare guests during Howl-O-Scream. Busch Gardens will provide the costume, makeup and masks needed to get you in character, but you’ll need to bring your own black pants and black shoes. You have to be 18 years old and be able to walk, stand or perform physical activity for prolonged periods of time. You must be available between the hours of 5 p.m. and 3 a.m. during event nights and some rehearsals. Previous experience as a performer helps but is not required. Pay starts at $9.75 an hour. Auditions are Aug. 11 and 12, but you must apply first to secure an audition spot. See here for more information or to apply. 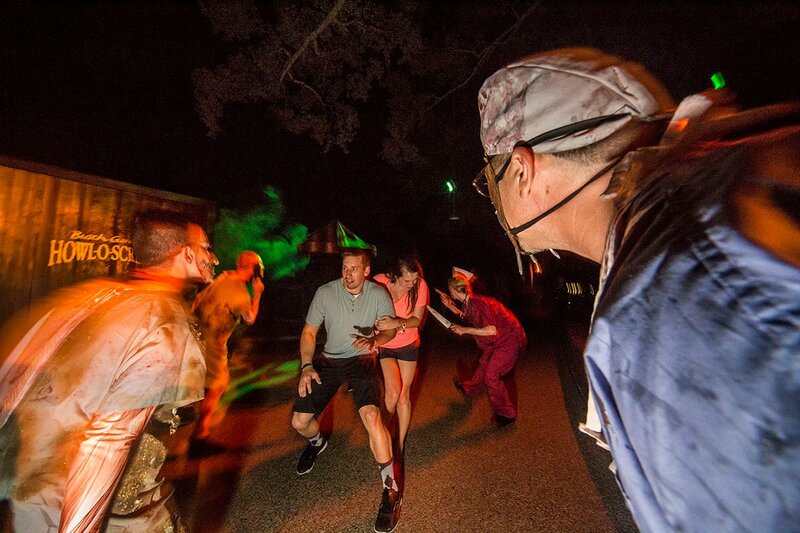 Busch Gardens in Williamsburg, Virginia, is also looking for scare squad event performers. Pay starts at $9.40 an hour. There will also be spots available for 16- and 17-year-old applicants. Apply here. SeaWorld San Diego is looking for performers for its Halloween Spooktacular Event. These seasonal workers will dance and engage guests while portraying different characters, including members of SeaWorld’s spooky school of fish. You’ll need to be 18 years old and have previous performing arts experience. You also should be able to lift up to 50 pounds and be able to stand or walk for long periods of time. Pay is $18 an hour during rehearsals and $25 an hour for shows. Work benefits include free park admission and complimentary tickets. Auditions are Aug. 5, but you’ll first need to apply. To audition, you’ll need to prepare a one-minute family-friendly comedic monologue and be prepared to perform a character improv or read from a script. Rehearsal dates start Aug. 21. The Spooktacular shows occur on Saturdays and Sundays from September 23 to October 29. See here for more details or to apply. Six Flags is hiring seasonal employees to be part of Fright Fest at various locations. The amusement parks are looking to fill slots for scary characters, character escorts, makeup artists, performers and other related roles. This job posting for a zombie/scare actor at Six Flags St. Louis requires applicants to be at least 16 years old. In addition to “competitive wages,” the job includes free tickets and employee discounts. You must be comfortable wearing a costume, makeup and possibly prosthetics. Other roles may have different requirements. See here to check if the park nearest you is hiring. Nicole Dow is a staff writer at The Penny Hoarder. She grew up wanting to go to Fright Fest at Six Flags every year but never went. Last year, she attended the Halloween Spooktacular at Sesame Place.